This is the second edition of Spellsy's Stat Cards using statistics from high level games (Platinum-Diamond) across all regions (NA, EUW, EUNE, and KR) to find the optimal builds, good counterpicks and common runes. This infographic is in partnership with champion.gg who assisted me in collecting the data for this graphic. As well, the Win rate, Play rate, Ban rate, and Matchups are straight from champion.gg. The rest of the information (runes, masteries, items, skills, etc.) is based on a 20,000 game sample with 5,000 from each of the 4 major regions listed above. 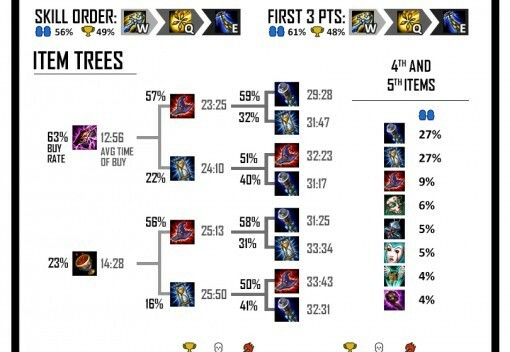 For our next edition of the Stats Cards we chose the 5 most picked mid laners in 5.2, Ahri, Leblanc, Xerath, Kassadin, Zed. Note: We removed the win rate from the Item tree because after more investigation the win rate corresponded more often to what people bought when ahead rather than the item choice causing more winning matches. Ahri with her huge buffs went from 52.31% win rate in 5.1 to 58.41% win rate in 5.2, becoming the highest win rate for any champion by far (2nd is Nidalee Jungle with 55.25%). 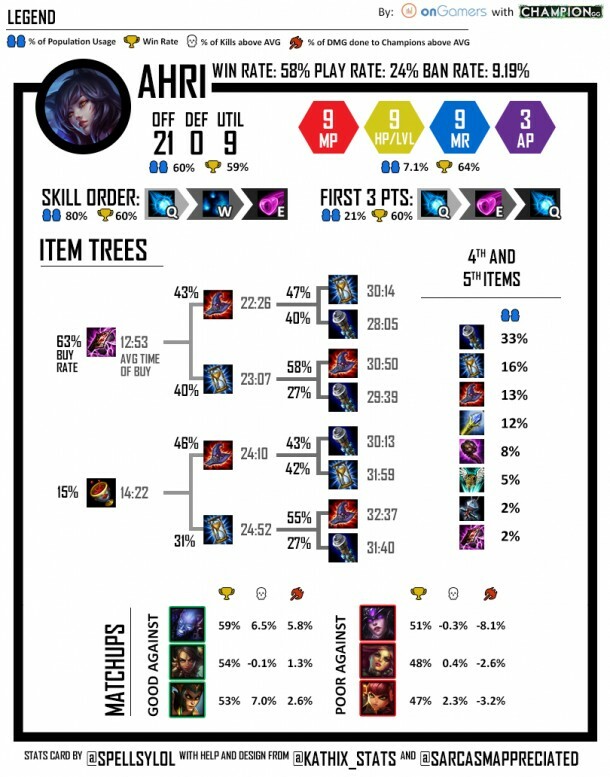 The most popular rune page for Ahri uses armor seals instead of scaling health seals shown above, but has 7% less win rate (56.6%). Surprisingly Kassadin has much higher win rate with AP/Lvl win rate on his glyphs over MR glyphs, probably due to his late-game focused role. Leblanc has the most diversity in her skill build with only 56% of players going W>Q>E. 28% of people went Q>E>W, and a large amount alternated with W and Q. 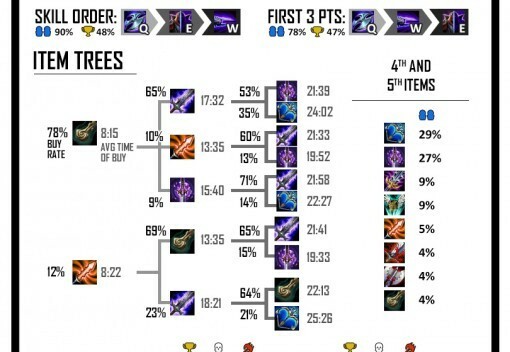 While AD marks are the most popular rune on Zed, Armor penetration has 6% more win rate when used as his marks. 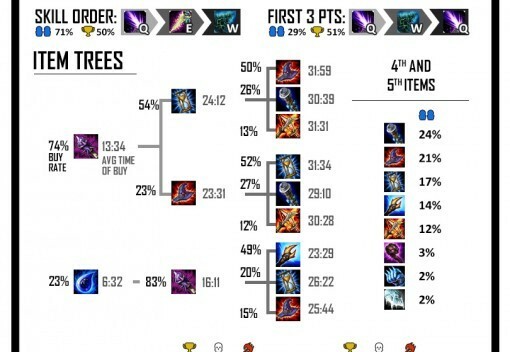 Xeraths maxing Q>E>W is the most uniform build with 91% of Xeraths going this build.